Our Cowhide Lunar chairs are phenomenal; it's such a great mix of sleek chrome and natural cowhide. 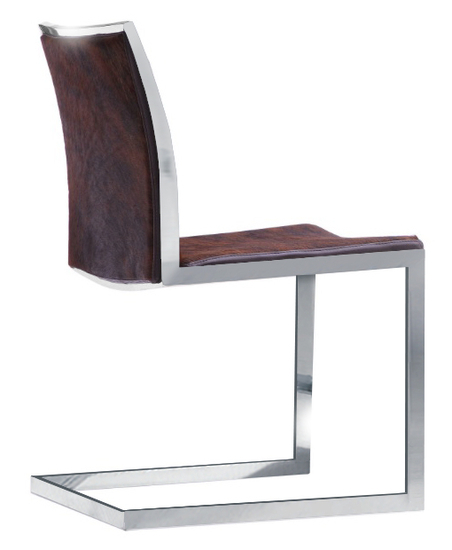 The Chair features a gorgeous cantilever metal frame and cowhide upholstered seat and back. Its softly padded seat and backrest run together and carry a gentle slope throughout to offer an incredible comfort. The versatile Lunar chair in cowhide is expressing elegance the modern concept of living. Not only is the cowhide Lunar chair is beautiful and unique, but this is a piece of furniture you will cherish for years to come. -- Please Choose an Option --	18.5"W x 22"D x 32.25"H: Seat Height: 17"